It’s 3:00 on Sunday afternoon, and the phone rings. A high-pitched frantic voice asks to speak to me. My wife hands me the phone, somewhat suspiciously; I notice she doesn’t give me much privacy. Through a torrent of tears my client explains she decided to color her own hair. The instructions sounded so easy, and “Hot Tamale,” (yes, it’s an actual hair color name), looked like the perfect color. 1. The Horrible Haircut. Luckily, most “bad” haircuts can be salvaged with the right amount of trimming. This may require cutting your style a little shorter. But a well-proportioned shorter cut is more attractive than a choppy, unbalanced or mangy longer cut. 2. The Repugnant Perm. Perms, by their very nature, can damage the hair, often creating frizz and reduced shine. Avoid using more chemicals. Special conditioners can help. Serious damage may require serious cutting. Set up a consultation with a professional. 3. The Catastrophic Color. Unfortunately, most women don’t end up looking like the picture on the box. Getting your color to come out even and natural looking can be tricky. Even worse is paying the salon price and ending up with apricot-colored hair. Color mistakes can be fixed, but it may be costly and time consuming, depending on the products and processes that are needed. 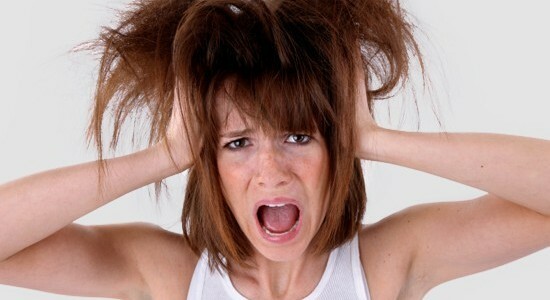 The main thing to remember during any hair emergency is to stay calm. Don’t try to fix it yourself or go to the first place that can get you in. Find a stylist experienced in your type of hair emergency. Most stylists offer complimentary consultations to discuss your hair needs. If you know and trust the salon where you had the service, call them first. A professional stylist will want to know if there’s a problem and make the client happy. Take a deep breath, and be willing to wear a baseball cap for a few days.